Friday night's show at Silvie's went SO well. I had an unbelievable amount of fun and I even made a few bucks which was really great. There was a slight mishap where the plastic of my guitar strap literally shattered, but a fellow musician let me borrow hers. Other than that, it was perfect! But now I am preparing for my next show, this Thursday and the Double Door with MachineGun Mojo! There will be lots of rock, twang, possibly a bar fight. WHO KNOWS?! 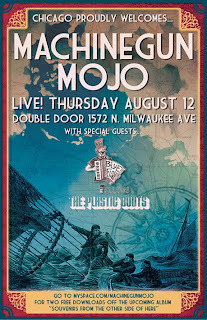 Come and check out the rock gods of MachineGun Mojo. They'll croon, you'll swoon. I will play cello and you will be all, "Hey, that's pretty cool."